The Grumpy Economist: FOMC statement and the new normal. The Sept 17 FOMC statement made the usual waves in the when-will-they-raise-rates commentary. But the separate "policy normalization principles and plans" document is, I think, more interesting. And since the Wall Street Journal called it "a new technical plan for how it will raise short-term interest rates" and then moved on, it is I think worth a bit of examination. What does this mean? The Fed has about $3 trillion of reserves outstanding, and required reserves are about $80 billion. The old way of raising rates would require that they sell off $2.9 trillion of assets, soaking up $2.9 trillion of reserves, so that interest rates will go up without paying interest on reserves. I illustrated this in the graph on the left. Instead, the Fed will simply keep the $3 trillion of reserves outstanding, and just pay interest on them. I illustrated this in the second graph. The idea is, if the Fed pays 5% interest on reserves, banks will compete with each other to get depositors, and thus start paying 4.99% on deposits. Banks will also charge at least 5% on loans. Depositors will dump their treasuries until those rates go up to 5%. And then Treasury rates will also go up to 5%. Whether it will work, whether banks are really that large and competitive, will be interesting to see. Banks sure haven't competed credit card rates down to zero. And if you decide to raise the minimum wage by paying your gardener $15 per hour, that won't raise the whole minimum wage in the country. But the Fed is bigger, and my guess is that it will work, or at least will appear to work so long as the Fed doesn't try to raise rates 5% overnight. Which it won't. Anyway, I approved of interest on reserves and a big balance sheet in a recent WSJ Oped and associated blog post so I still cheer. OK, what is this? Basically, the Fed will allow financial institutions that aren't banks to have interest-paying reserves. Again, I approve loudly. If banks turn out not to be that competitive, and just take money, pay no interest, and earn interest on reserves, now other institutions can get in the game. That should help raise rates. If you make the offer to the gardener next door, he too will get $15 an hour. I like it, and also loudly like opening reserves up to everyone. Who can object to lots of interest paying electronic money that cannot default and cannot have a run? Alas, the naysayers seem to be winning on this one. As I understand them, the counterarguments are mostly political, not economic. Those are respectable arguments, but don't address the economic desirability of opening up reserves to non-banks. Fortunately, "necessary" and "needed" are pretty vague, so I suspect this will in fact go on a long time. So, at least they won't sell any securities -- and thus deal with the ramifications of taking losses. But they won't keep the large balance sheet. Since my oped encouraged them precisely to keep the large balance sheet, I'm disappointed. A small balance sheet means small reserves, potentially paying less than market interest on reserves, re-stoking the whole shadow banking business that just exploded in our faces, reducing a large completely safe fraction of bank assets, and leaving the looming uncertainty about just what the reserve regime will be. So, one thumbs up, one neutral, and one thumbs down, at least relative to my admittedly unorthodox ideas. Translation, we'll do what we feel like doing at the time, and continue to argue about it. In this case, I'm grateful for the discretion. I think we have reached a new era. We have discovered that massive reserves which pay the same interest as treasuries are not at all inflationary, and a great bedrock for a new financial system. We should not forget those lessons and go back to a monetary policy regime that was part of a financial system that blew up. A last piece of unasked-for advice. Dear Fed, don't use the word "normalization!" You may discover that a huge balance sheet, reverse repos for everyone, and even near-zero rates and zero inflation are a permanent and healthy policy configuration. If you've called tiny reserves that don't pay interest "normal," it's going to be awfully hard to accept that the "new normal" is just fine. Maybe now is "normal!" We have discovered that a massive balance sheet is not inflationary - but you do occasionally warn about tail risk. 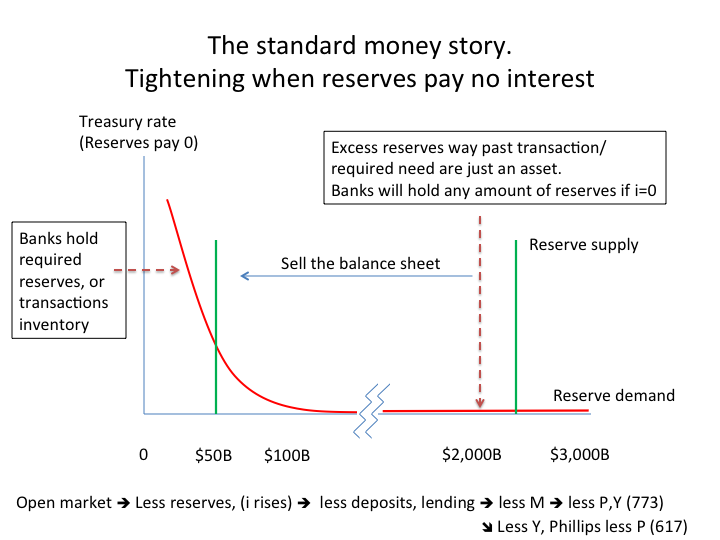 You see as others do that there is some limit to balance sheet expansion before price stability is affected, and that is why reserves will never be open to "everyone". Most of the world will be excluded from access, and this means that there is no way to avoid an international hierarchy of money. Runs will be possible on dealers that connect two layers of the hierarchy. Even if they are outside the U.S., Americans like Larry Summers might be sent over with a bailout package as part of a "committee to save the world". Full-reserve banking in the U.S. doesn't protect us from systemic runs in other parts of the global financial system that concern the U.S. and would require interventions. What we need is a design that prevents systemic runs at all layers of the hierarchy, even if it allows runs on individual institutions. How many gardeners are in line ahead of me? Can we skip the banks and financial institutions and do something for Main Street? I'm a little tired of the "shower the megabanks with money and it will rain on everyone" approach. I feel something trickling down on me but I don't think it's water. "I like it, and also loudly like opening reserves up to everyone. Who can object to lots of interest paying electronic money that cannot default and cannot have a run?" Increasing the size of the welfare state is a good thing? "think we have reached a new era. We have discovered that massive reserves which pay the same interest as treasuries are not at all inflationary, and a great bedrock for a new financial system." We have discovered this - really? I think you must be under the impression that a central bank can set a real interest rate. "If banks turn out not to be that competitive, and just take money, pay no interest, and earn interest on reserves, now other institutions can get in the game. That should help raise rates." Why would it? If any institution can get a 5% risk free real return from the central bank, then why would it put any money at risk? I guess this also means that you can kiss goodbye the profits the Federal Reserve has been sending Treasury the last few years. Paying higher interest on reserves will likely cause the federal fiscal deficit to increase by as much as $100 billion per year. Thanks for the reply, but I don't really follow your math or your timeline of "Before" and "Now". Perhaps it's my fault, but a bit more detail would be appreciated. As I saw (see) it, the Fed nets the interest earned on its assets (e.g., Treasury securities) with the it's operating expenses and interest it pays on reserves. Last year, it remitted about $80 billion to Treasury which is counted as revenue (offsetting the deficit). If the interest rate on reserves of $3 trillion goes up to 5 percent (your scenario) that's $150 billion. Sure, the Fed keeps its current portfolio of assets, but the interest rate on those is constant, no? John, what about raising reserve requirements (RR)? I realize there are reasons not to like that (Mark Sadowski has called the fact that the US is amongst a handful of nations with both IOR and positive reserve requirements akin to wearing a belt and suspenders), but what do you think of the idea? Theoretically the RR could be raised to any level, even above 100% if need be, w/o "costing" the Fed anything and without having to sell their assets (open market sales). Sadowski and Sumner called using RR for this "crude" and Sadowski said IOR was the more "modern" approach. What do you think? Having the FED mark to market it's holdings of Treasuries assumes that the Fed could get in a situation where it would somehow be forced to sell or the federal government could get in a situation where it is forced to buy. The Fed does not operate at the behest of share holders interested in the profitability of the Fed. The Fed never faces a liquidity problem. Why would the Fed ever have to sell into a down market? The whole point of mark to market is for valuing companies that can go bankrupt, can become illiquid, or have to meet shareholder demands for profitability. The Fed is not in danger of any of these potential problems. From the point of view of the economy and the banks there should be very little (or no) difference between the banks on the one hand buying treasuries directly or on the other hand depositing excess reserves with the Fed who would use the money to buy treasuries (some of which might have a longer maturity date.) The Fed would become (remain) the world's largest money market fund. Deposits with the Fed would have slightly lower transaction costs and slightly higher liquidity. The fact that the money can be withdrawn on a moment's notice makes the accounts slightly less stable as a funding source than treasuries. Even with a short term treasury you have to wait for it to mature before demanding your money from Treasury. It depends where the interest payments come from. If they are printed into existence (Central bank pays interest on reserves to banks) or if they are paid out of tax revenue (Federal government pays interest on federal debt to banks). the Fed will simply keep the $3 trillion of reserves outstanding, and just pay interest on them. I illustrated this in the second graph. that would be 150 billions dollar in additional profits for the banks... Why ? "Since my oped encouraged them precisely to keep the large balance sheet, I'm disappointed." Wait, so... you're *not* the puppet master?! "... my admittedly unorthodox ideas"
As to interest rate adjustments, they’re a farce for the following reasons. First, a recent Fed study showed there is little relationship between interest rates and investment spending. Second, as Galbraith put it, “Firms invest when they can make money, not because interest rates are low”. Third, the money for interest on reserves comes from general taxation, i.e. out of the pockets of ordinary households, and gets paid to rich idiots, i.e. people with piles of cash who are too dumb to be able to think of anything useful to do with their cash. Fourth, Interest rate adjustments are DISTORTIONARY. An interest rate change works only via households or firms which are significantly reliant on variable rate loans. I.e. those reliant on FIXED rate loans or not reliant on loans at all are not directly affected by an interest rate change. If the central bank can't make you borrow, then how are interest rate changes distortionary? Before borrowing, you have a choice when deciding between a fixed / floating rate loan. You know (or should know) the risks before you enter into the agreement. You could argue that open market operations by the central bank are distortionary IF the central bank can buy / sell government bonds from you without your acquiescence. I have seen a lot of references to "distortionary" measures engaged in by either the central bank or the federal government. Here is my definition of distortionary - how does it compare to yours? Either #1. Any action by the central bank / government that violates a legal framework that is agreed upon prior to the act being committed. For instance if a central bank gave you a fixed rate loan and then later changed it to a variable rate loan without your permission, that would be a distortionary action by that bank. Government exists primarily as a legal system to settle disputes between two or more parties. And so you may conclude that a government / legal system paid for through taxation that is shared through an economy is not distortionary. But you still might conclude that a central bank / government that tries to insure parties against actions that are natural (earthquakes, floods, etc.) or beyond a government's legal reproach (foreign invader) is acting in a distortionary manner. Should the federal government intervene in the "natural" order of things to provide flood / earthquake / hurricane relief? Isn't this distortionary? I prefer definition #1 of distortionary from above, though I can understand people wanting to limit the powers of a government and preferring definition #2. Finally, there is the anarchist (law of the jungle) types that perceive all government / legal systems as distortionary. Galbraith seems to be that type. I like the idea of the Fed buying the entire national debt. That may get the economy going. If it does not, then inflation and interest rates will stay dead and we will have monetized the debt for free. I think you are being unfair suggesting these are "admittedly unorthodox ideas" - they aren't and many inside the institution and at peers (the RBA for one) see the value in large ongoing excess reserves. Do consider the impact of the LCR on bank demand for HQLA and the extent to which the US banking system uses reserves to fulfill the LCR requirement. 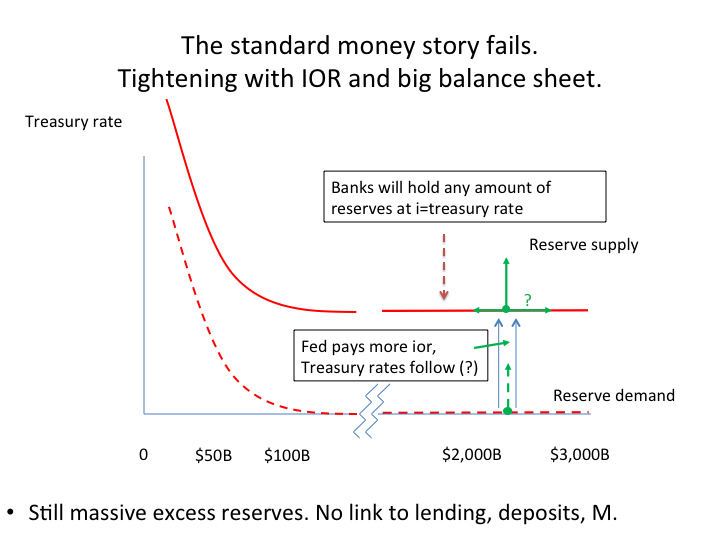 For those who suggest raising the reserve requirements, this is the same as Basel's LCR which will lead banks to bid for deposits because of their need for HQLA Given your intellectual proximity to several of those on the FOMC who favor a cap on the RRP, either through false concerns of exacerbating runs or the more cynical (but appropriate) political sensitivity of subsidies to money market funds, please continue to advocate a persistently large SOMA portfolio as it is much better to have the Fed engaged in maturity transformation to meet arbitrary rating agency concerns about the WAM of the public debt as opposed to depending on shadow banking regulatory arbitrage (or worse, improperly priced FHLB advances) to meet the new HQLA requirements. From a control theory point of view, at first pass, it makes sense to use the IOR (possibly open to all, but at least any credit issuing intermediary) as the primary tool to control the short term rate rather than the target Fed Funds rate and open market operations and the Discount Window which work through higher levels of indirection. It's not clear, again at first pass, however how this interacts with the RR if it's open to all (all customers). If the Fed increases the IOR, deposit liabilities of Banks would be expected to flow to the Fed, decreasing the RR of the Banks. In the limit, this is divergent. Banks accumulate assets and the Fed accumulates liabilities. The counter to that is probably that you increase the capital requirements for Banks in some proportional way. Is this all that different than increasing the RR? Full Reserve banking often appears to be a half thought through concept. Without some form of "Printing" money growth in the FR system is permanently limited. To the extent that an open Reserve system approaches a FR system it suffers the same limitation. As I recall, Friedman proposed having a computer calculate the increase in reserves that would have to be added to the system (by printing) to maintain a stable rate of inflation. Going back to the control theory view, it should be clear that that one optimum approach is to use only fiscal policy, controlled by a computer, to maintain stability. You could then use the Friedman split of demand vs. time deposits to finance private sector expansion, and have the fiscal PID algorithm provide the desired stability. The government would always supply productive employment at a rate determined by the PID algorithm with an output gap which was both ethical and politically stable (which due to the I component has income always less than the target in the stable limit) and simply print the money to provide this (since no money is created with FR). Your research grant, infrastructure project, ..., S.S. check, Medicare reimbursement, ... would always be X +\delta X, where \delta would be small compared to the current fiscal fluctuations and determined with some reasonable time constant based upon just two feedbacks, unemployment and inflation.